The m-m-m-m-m good ice cream will be available starting July 2 until it runs out. Add a piece of pie or cake to your treat on July 4! Back in 1962, Elza Breidenbaugh and Emil Leistner got their heads together when they decided that there was something missing from the annual 4th of July celebration–ice cream! It was July, after all, and in hot weather, it just makes good sense to have homemade ice cream. That first year Elza and Emil (and some volunteers throughout the day) took turns hand-cranking 2 5-gallon White Mountain brand ice cream makers. The number of blisters on the hands of the volunteers after all that cranking more than likely rivaled the population of the town. 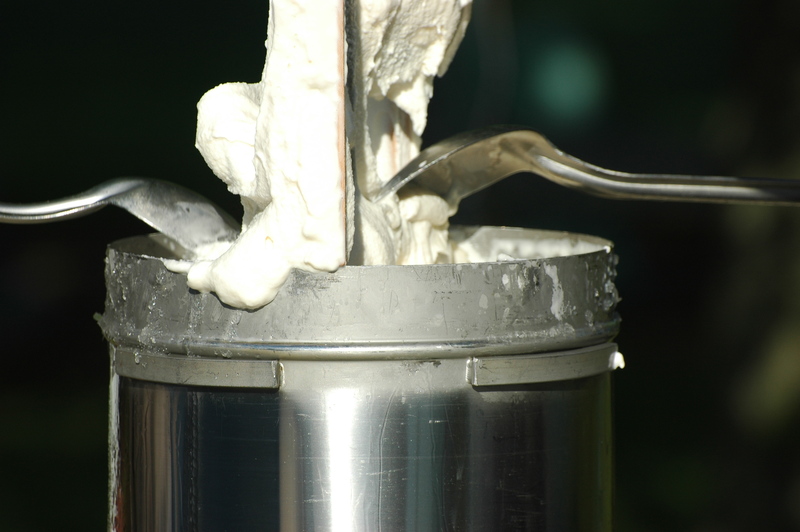 cream making by hand was mechanized. A contraption that consisted of a bicycle rim, a pulley, and an electric motor then successfully ran 4 and 5 White Mountain freezers. And, as usual, no matter how much was made, it ran out before the requests for it did. 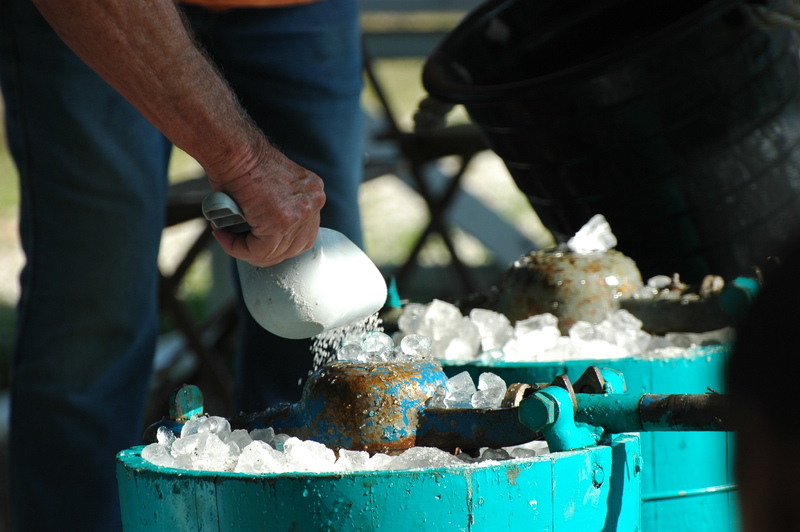 Now that the event is three days in length, more and more ice cream is required and the tradition was passed on a number of years ago and is going strong with Elza’s son, Charlie and several other men in the area. This year’s batch will consist of 300 gallons of the wonderful stuff. On Tuesday morning I found Charlie and a dozen other good guys out at the Young Farmer building on the grounds of the celebration churning away those 300 gallons. It’s pretty much a science these days. 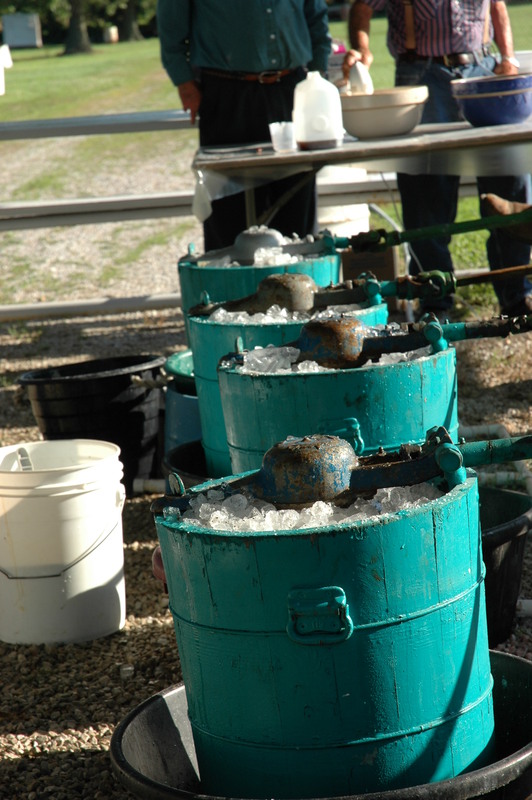 The ingredients are added, the electric motors attached, and then, in 22 minute increments, it is churned 4 batches at a time–65 gallons. Squirrel Barrett is the official timer of the 22 minute increments. The other guys, of course, all do their various jobs that have become second nature. And these guys make it look easy. I had to remind myself as I was taking pictures and watching that it is 300 gallons of ice cream…that’s a LOT of ice cream. Anything but easy work. They were kind and let me have a sample–WOW. Just as I remembered–perfection in a Styrofoam bowl. The recipe? Are you kidding? Charlie was generous enough to mention that some of the necessary items included liquid pasteurized eggs from Roseacres in Dubois, whole milk, and half and half. Those initial ingredients give a good indication of why this stuff is just so very good. One of the delights of small towns is tradition. 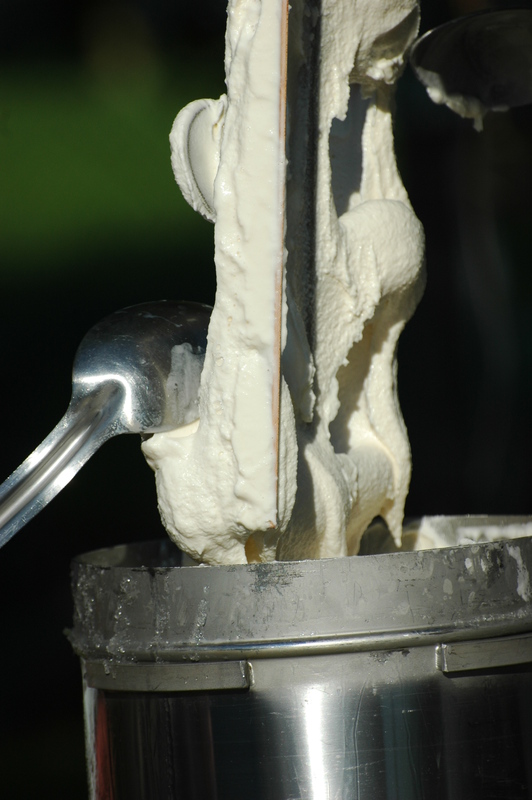 In Otwell at the 4th of July, homemade ice cream is a sure delight for so many of us year after year. Can’t wait for that first spoonful of this year’s dip.